I know what you're thinking, the combination of bacon and kale makes no sense! One item that is super unhealthy and one item that is super healthy...yet these two ingredients (plus a few more) come together wonderfully in a delicious pizza that will leave you wanting slice after slice. You'll be amazed at how simple, yet flavorful this pizza is. Move over Pizza Hut! This recipe originally calls for Pillsbury pizza dough, however you can obviously substitute for anything that you want...homemade pizza dough, pre-made rounds from the grocery store, etc. You'll notice that there isn't any sauce mentioned...the onions alone once cooked through help the pizza retain some nice moisture without leaving it soggy or too crisp. You can certainly add in sauce yourself, sometimes we spread on a thin layer of Renee's Mighty Garlic Caesar salad dressing...sounds weird, but adds in some great garlic flavor! I can use that s*** on anything! Also...the original recipe calls for seasoning with salt and pepper, but seeing as how you've got a bunch of bacon piled on the pizza, I think it's safe to assume you can skip the added salt! Preheat oven to 400 degrees w/ rack in upper third of oven. On a floured work surface, roll out dough and gently press even with fingers. Transfer to a baking sheet with bread crumbs sprinkled to help prevent sticking to the pan. Top with mozzarella, onion, and bacon; season with pepper. Bake until dough is cooked through and edges are golden, 15 – 20 minutes. 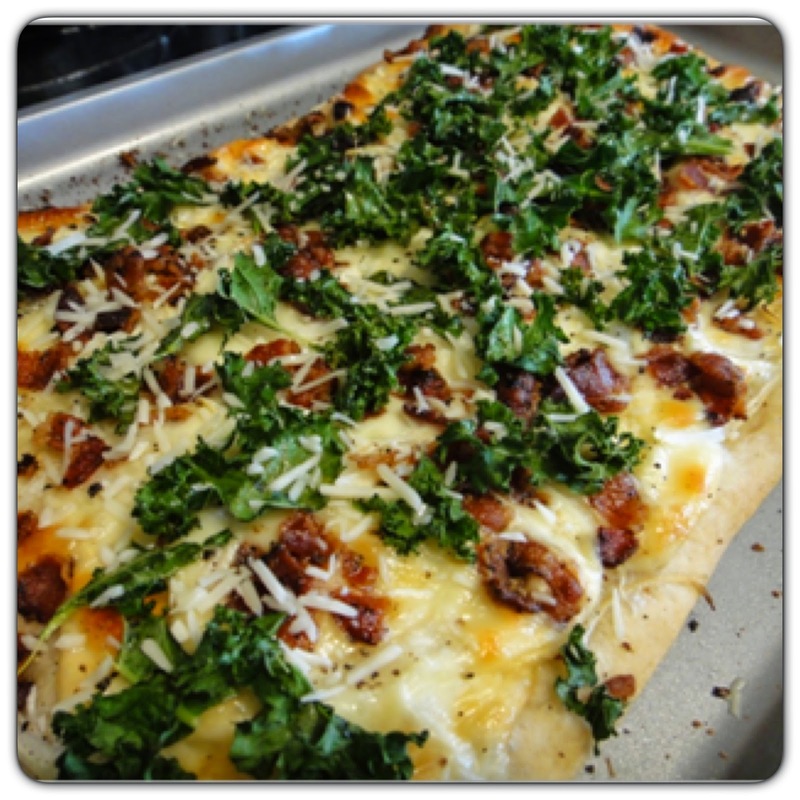 Heat broiler on low, pull out pizza, top with Kale, drizzle with oil. Broil until kale is wilted and slightly crispy. Approximately 3 minutes. Top with parmesan cheese (optional).